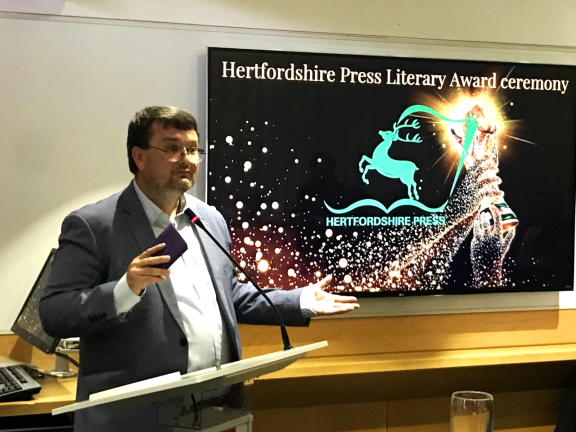 In the capital of Great Britain, the homeland of so many classics of world literature, Hertfordshire Press held its annual award ceremony of 2018. Out of 26 published books, five books were given awards in different categories. The awards ceremony took place in London on 11/01/2019, in the most prestigious library in England – the British Library. 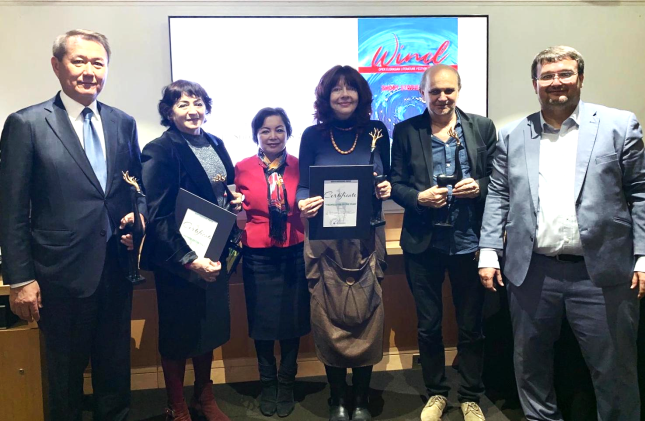 The ceremony was hosted by David Parry (fellow of the Royal Society of Arts, first Chairman of the Eurasian Creative Guild (London), and the winners in each category were presented awards by Marat Akhmedjanov (publisher of Hertfordshire Press and vice president of the Eurasian Creative Guild). Guests at the ceremony included creative intellectuals from London and representatives of embassies of Kazakhstan, Tajikistan and Azerbaijan. The translation of Leyla Aliyeva’s book “The World Dissolves like a Dream” brought Caroline victory in the category “Best Translation of the Year”. Winning in one of the most difficult categories marks her amazing professional qualities as a translator, which are reflected in her works with authors. The book “The World Dissolves, like a Dream” includes 130 poems in English, which were translated by famous English writers and translators Caroline Walton and Anne Marie Jackson. The book was also edited by Caroline Walton. The book has been published on the initiative of the Translation Centre of Azerbaijan under the guidance of Afag Musud. The idea behind the book “The World Dissolves like a Dream” is to popularise the highest achievements of the national literature of Azerbaijan in the wider world. The poems also reflect the modern literature of Azerbaijan, which is distinguished by its expressiveness and vivid originality. 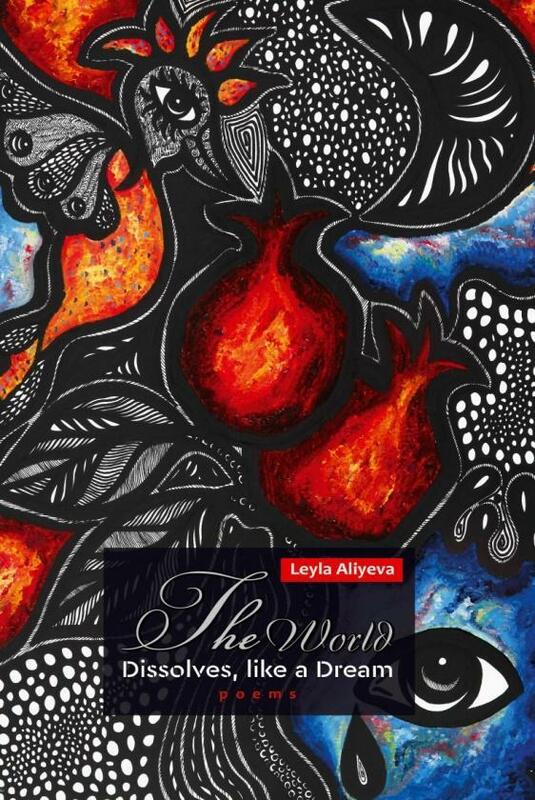 The idea for the book arose as a result of interest in Leyla Aliyeva’s work and the sincerity of her poems, which found a response not only in the writer’s homeland, but further afield in other countries. As is well known, the verses are included in the Anthology of modern Azerbaijani literature, which has been translated into many languages of the world. Therefore the publication of this book was dictated by popular interest in the poems of Leyla Aliyeva and by the quality of the translation. Hertfordshire Press (SRM Group) is a unique publishing house which unites English-speaking readers with Eurasia through the publication of books by authors of the region, and magazines and guidebooks. It also holds literary festivals and forums. Since 2002 the publishing house has specialised in the publication of modern fiction and popular scientific literature by Eurasian authors, as well as the re-publication of works of past years which are not available in English. The catalogue of the publishing house contains more than 200 works of authors from 15 countries with a total print run of more than 1 000 000 copies. The Eurasian Creative Guild (London) is a public non-profit organisation, a new meeting place for creative talents. As an actual and virtual association, the Guild generates a framework within which creative people from across the board can come together and discuss their work. Indeed, the Guild has already enlisted dozens of significant cultural figures from across the globe due to its proactive support for writers, musicians, illustrators, graphic designers, sculptors and poets along with anyone who considers themselves to be creative and is seeking promotion of their work around the globe and mutually beneficial cooperation. Today the Eurasian Creative Guild is an international non-profit organisation with headquarters in London, that is open for all like-minded people, inviting participation in activities and events in a role that everyone determines for themselves: as a member of the Guild; in the role of participant or as a sponsor of events and projects. Overall, the Guild’s mission is to ensure real dialogue and genuine interaction between designated representatives from all sectors of the creative (intellectual) elite, public and governmental organisations, as well as the business community. It thereby constructs a mutually supportive forum for all creative members.